Old Catton lies approximately one mile to the north of Norwich. Originally it was a distinct village but is now part of the suburbs of the city. 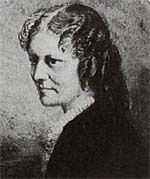 Anna Sewell lived at 'The White House' at 125, Spixworth Road when she wrote her classic children's story Black Beauty. Despite being for children, it is a harrowing tale of man's cruelty towards horses. She was in her late fifties when she wrote the book and received £20 for the rights. Amazingly, by the time she died - only five months after the book was published - 100,000 copies had already been sold. The book was published by the Norwich firm Jarrold's. It is said that the model for 'Black Beauty' was a horse called Black Bess which her brother Philip used to ride from Old Catton to Dudwick Park at Buxton each week. Anna's grandparents owned a farm at Buxton and it was here that she first learnt to ride. Catton retains a good deal of charm and, even today, horses are grazed on the Deer Park opposite Anna Sewell's house. Catton Park was originally designed by Humphry Repton (who is buried at St. Michael's Church in Aylsham) and today it is managed as a conservation area. See also Lamas, Great Yarmouth and Norwich.